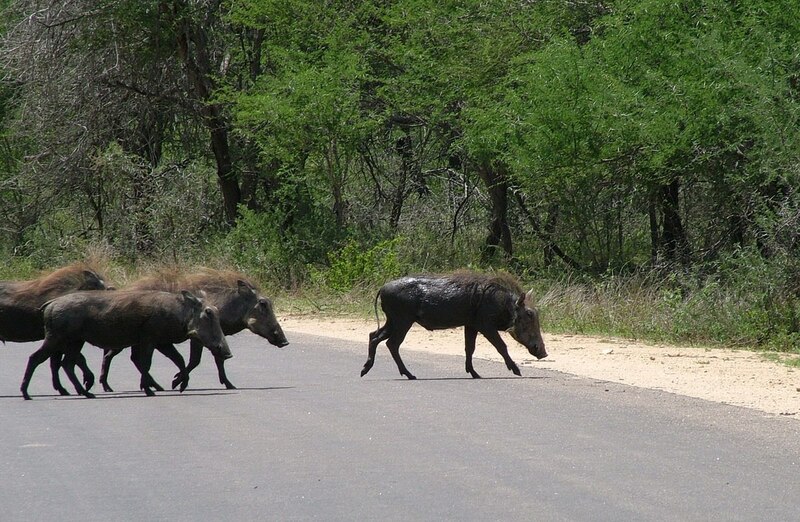 I couldn’t help myself but every time that Bob and I saw warthogs in South Africa, I thought of Pumbaa, the warthog in the Disney film The Lion King. And when Bob and I were conducting our self-guided safaris within Kruger National Park, we saw our fair share of these unusual looking animals. 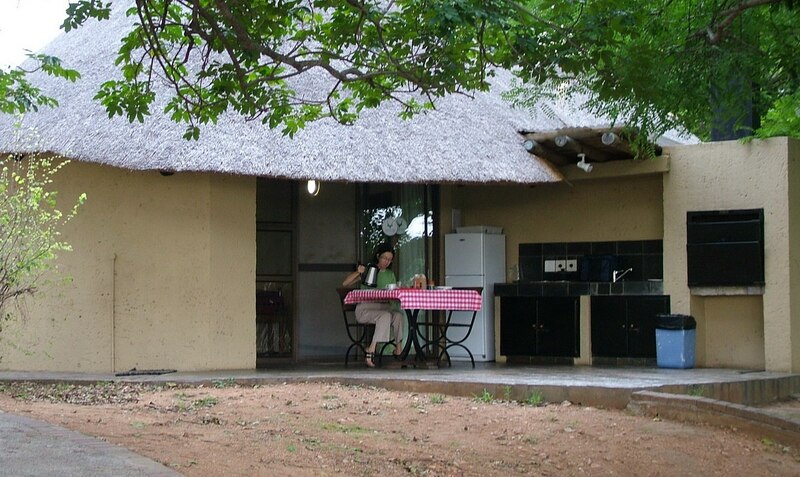 On our first morning in Kruger, Bob and I rolled out of bed at 5:30 a.m. not realizing how early it was but knowing that people had been stirring in neighboring huts for at least an hour already. It was at about that same time, 4:30 a.m., that the birds had begun to sing in earnest. The sun peaking around our curtains enticed us to rise and greet the day. From my bout of traveler’s diarrhea, I was feeling quite weak, so Bob set up an inviting breakfast table on the patio. 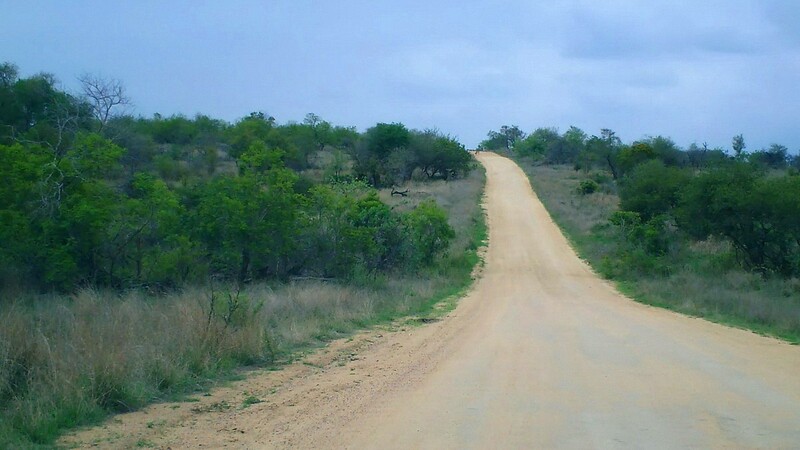 We wanted to engage in low level activity so set off on a self-driven safari along one of the many dirt roads that crisscross the savanna in hopes of spotting a few animals. The air was chilly when we climbed into our rental car, but before long, the mercury soared and there was no getting around the fact that it was hot. As we poked along the roadway, we put a great deal of effort into scanning the surroundings and into the depths of all vegetation growing along the gravel surface. Sometimes seeing the wildlife required no effort at all. It turned out that Common Warthogs are actually quite numerous in the Park, and we came across several different groupings of them over the course of our day’s excursion. 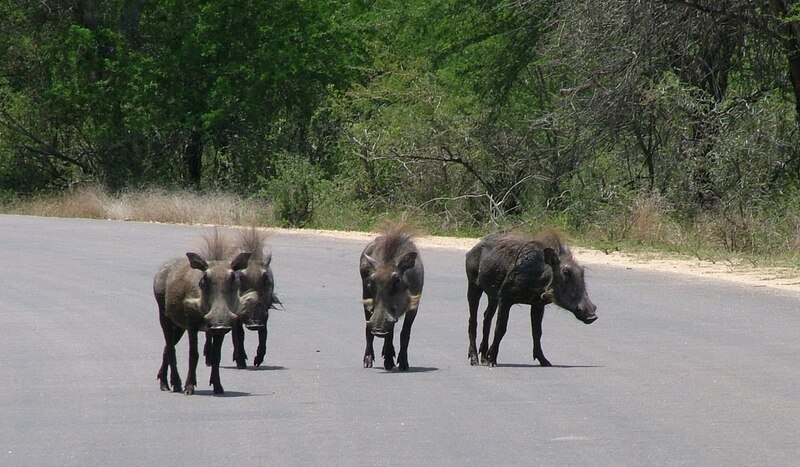 The usual density for these Warthogs throughout their home range is between 1 and 10 animals per square kilometre in protected areas such as the national parks. 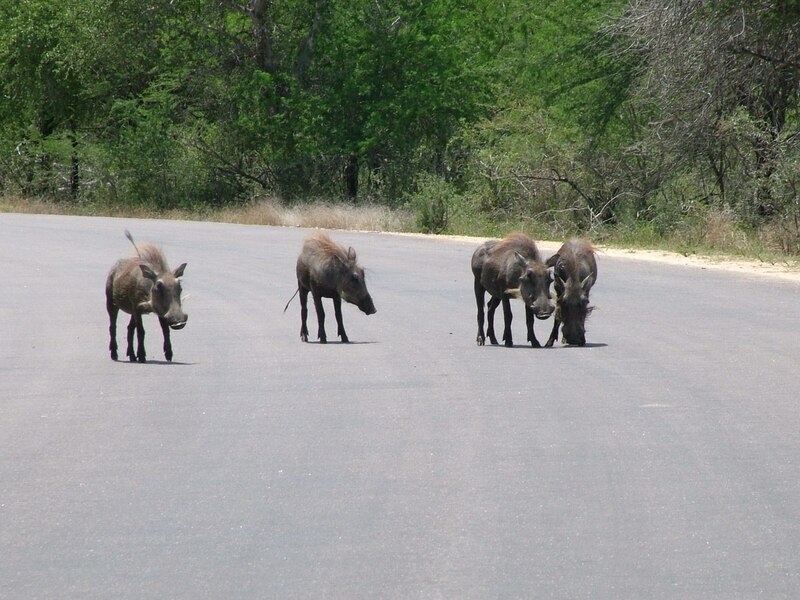 Bob and I were in no rush as we toured the vicinity around Skukuza Rest Camp because otherwise we might miss spotting some wildlife, so we came to a slow stop when we rounded one bend in the road and found a sounder, a group of Common Warthogs that live together. 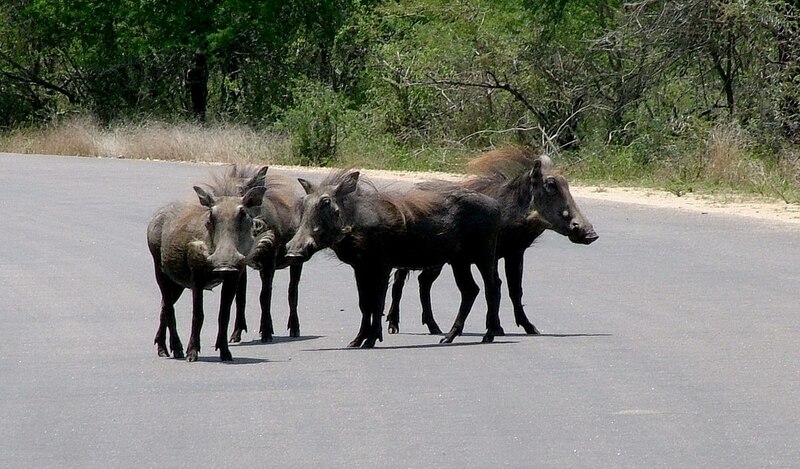 A sounder can consist of female Warthogs with their young and other females, or a group of males within the same home range but that live separately from the females. The Warthogs in South Africa are a subspecies called Southern Warthog. They are wild members of the pig family that can be found in grassland, savanna and woodland regions of sub-Saharan Africa, three types of habitat that meet their needs. Warthogs, because of their appearance, look very fierce, but they are no more than omnivores that graze on roots, fruits, grasses, fungi and bark. 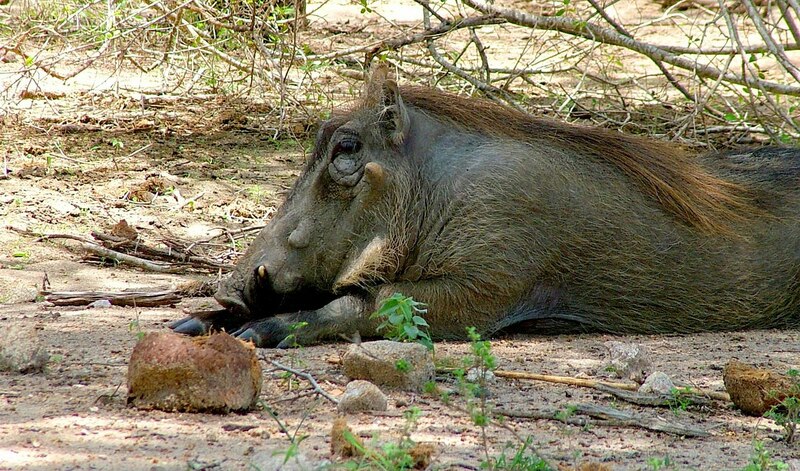 During the dry season, Warthogs root for bulbs and tubers by using their snouts, feet and tusks, but the rainy season brings a supply of short perennial grasses upon which Warthogs graze. Problem is a Warthog has a short neck and long legs so the animal is unable to reach the grass without kneeling down. 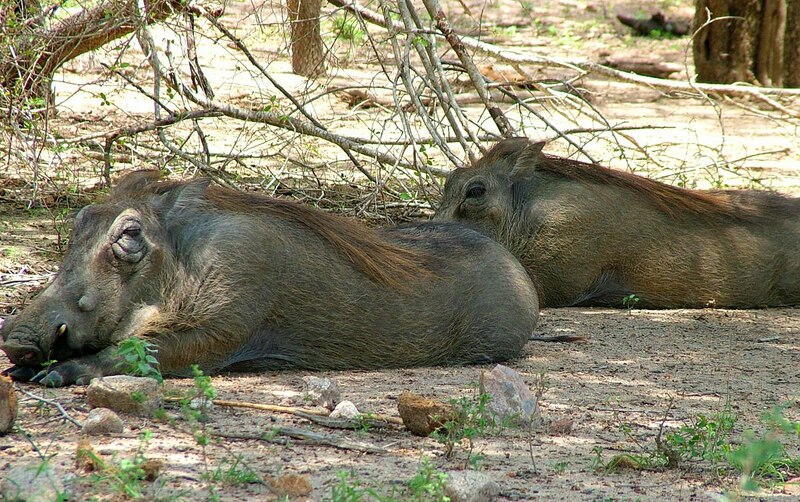 The knees or wrists of the front legs are calloused, hairy and padded to protect against abrasion from a Warthog’s movements. On top of having a short neck and long legs, a Warthog is considered quite ugly because of its other physical attributes: a disproportionately large flat head covered with warts, an elongated snout, sparse bristles covering its barrel-shaped body, a stiff mane of longer bristles growing along its back, and a sturdy physique with next to no fat to soften its appearance. 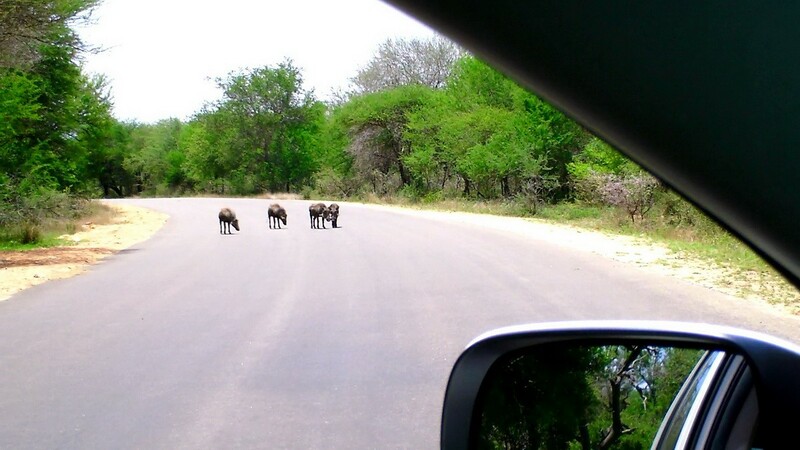 Strict rules govern visitors to Kruger National Park, and one of those rules stipulates that visitors must remain in their vehicles at all times. When the Warthogs moved off the roadway, we watched out the car windows as they retreated into the woods in a speedy fashion. 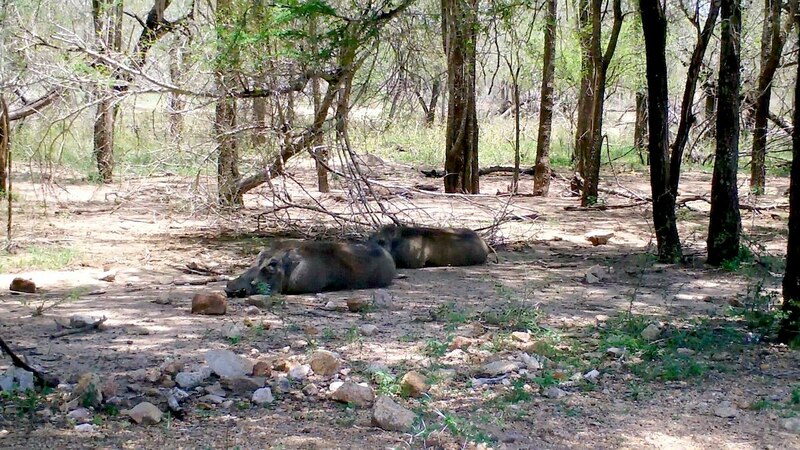 These particular Warthogs were not bothered by our presence because if they had been alarmed, they would have lowered their manes, flattened their ears, and become quite vocal. As it was, we heard no grunts or snorts as they headed into the underbrush. 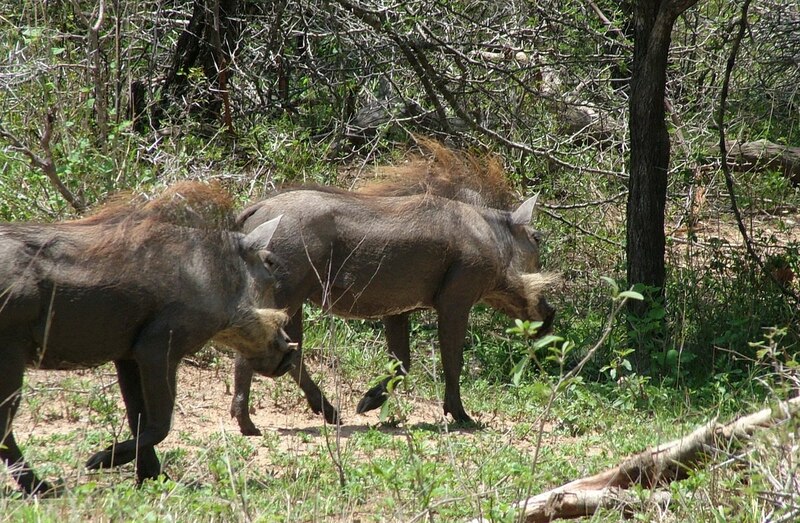 Warthogs prefer to avoid confrontation and will usually run away from any perceived threat. As a primary defense against major predators, sprinting at speeds up to 48 kms/hour (30 mph) will usually have Warthogs successfully eluding lions, leopards, crocodiles, wild dogs, hyenas, and even humans. 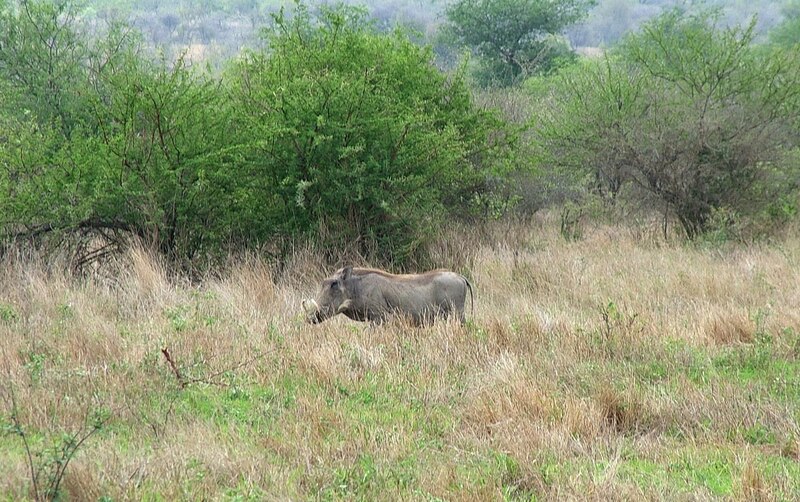 Not every Warthog that Bob and I came across was gallivanting about. In the heat of the day, it seemed that many of these husky animals were content to pass the hours reclining in the shade. 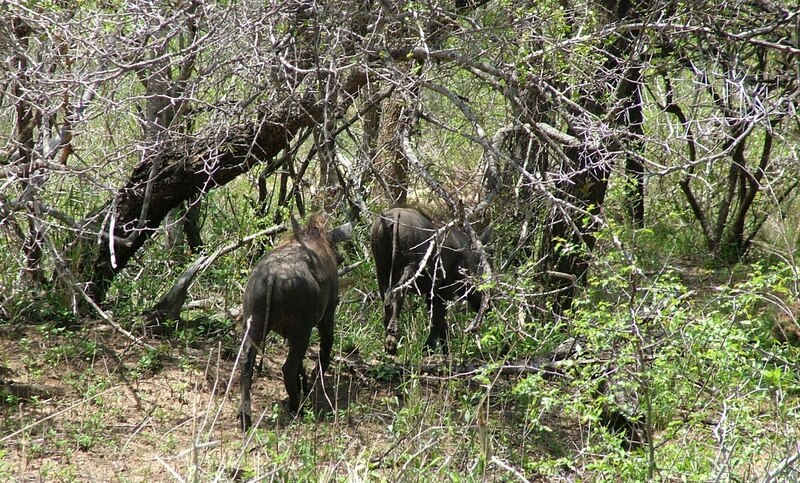 Given their grey or black skin, the Warthogs often blended into the shadows so well that they went undetected. 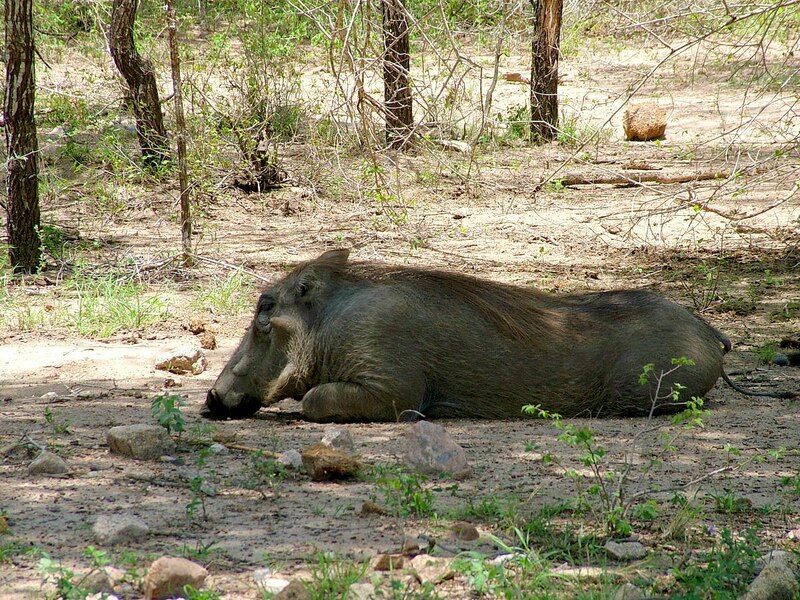 Spending the heat of the day in the shade is desirable because the lack of hair and fat on their bodies are two traits that make Warthogs vulnerable to extreme temperatures. 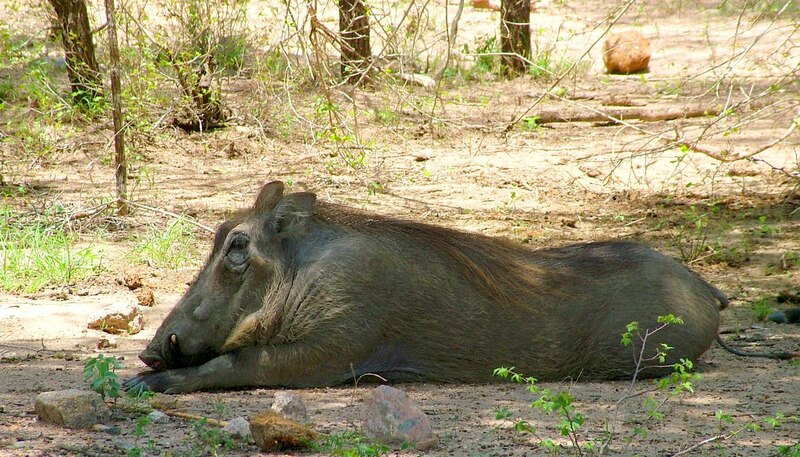 To assist in coping with hot weather, Warthogs will wallow in mud or submerse their bodies in a pool of water, and when colder temperatures threaten to cause heat loss, these animals will huddle together. As their name suggests, Warthogs have warts, but really, the numerous bumps that cover a Warthog’s face are not warts at all but rather thick, protective pads or bumps that help eliminate injury as males fight for breeding rights. Both males and females have warts although those on a male’s face are noticeably larger to protect them from competitive blows. This male’s large warts are quite obvious, whereas a third smaller one next to the jaw is more difficult to pick out. It is usually only the males that have a third set of smaller warts. Notice how the eyes are placed high on a Warthog’s face. This is a characteristic that makes it possible for Warthogs to watch for predators when kneeling and grazing in long grass. A Warthog’s excellent sense of smell and good hearing compensate for their poor vision. If my memory serves me right, this is the only Warthog with well-developed tusks that Bob and I saw in Kruger National Park. The tusks that we see curving upwards began as upper canine teeth that grow up to 25 centimetres (10 inches) long and take on a semi-circular shape. A second set of shorter tusks are rooted in the lower jaw, and it is these that are razor sharp. Every time a Warthog opens and closes its mouth, the bottom tusks rub against the top tusks with the result that the bottom tusks are honed. Warthogs are not what I would consider to be graceful or beautiful animals, but they are quite remarkable. They are able to thrive in arid regions because their bodies are adaptable. Like camels, for one, Warthogs are able to withstand living without water for long periods of time, even up to several months of the year during the dry season when all rivers and lakes disappear. We were quite thrilled to see such an abundance of these hearty animals.